This was a super simple pattern, found free here. 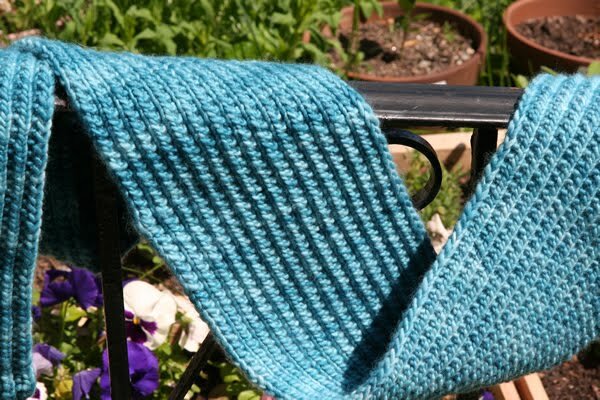 I used Malabrigo Worsted in Bobby Blue and size 8 needles. I will need a matching hat because this color doesn’t go with any of my hats. I don’t want it too matchy-matchy, which is why I only bought enough yarn for a scarf, so I will look for a complimentary color. Maybe gray? 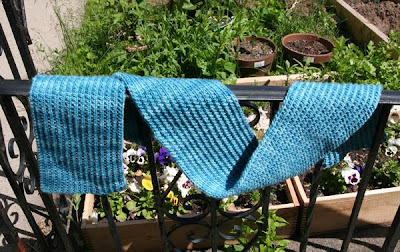 If I have a little of the blue leftover perhaps I can use it for an edging on the hat. Tomorrow I’m going to Windsor Button to find buttons for my Puff-Sleeved Cardigan, so I’ll look at potential hat yarns while I’m there. And of course this means I should have finished photos of my cardigan soon! Be patient though, because I have to block it and make sure it’s perfect before I reveal it to the world. That scarf looks so cozy! I love me some Malabrigo.